Songs of Eretz Poetry Review: New Poem: "Little Bottles of Wine"
"Little Bottles of Wine" is the next installment in my poetic memoir, A Wave of Poetry. It was a long held rumor that French MREs had little bottles of sweet French wine in them. 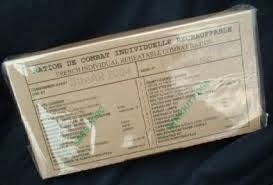 So, when a contingent of French Army arrived near our base of operations, we were most eager to trade our MREs for theirs.